Beginning its 8th season, Whim W’Him has once again ascended to new heights as the contemporary dance company to beat. In its third iteration of Choreographic Shindig, the season opening fete, Whim W’Him demonstrates its precise ability to attract top-tier, global talent. The Choreographic Shindig breaks tradition from other Whim W’Him programs, wherein the dancers themselves help to select outside choreographers from around the world. The third time's a charm, as this year's selections are by far the best this particular showcase has ever produced. Opening the evening is Portuguese choreographer Bruno Roque’s “The Background Hum of Stimuli”. The number begins even before the dancers fill the stage. The robotic voice of the pervasive Siri can be heard voicing commands over the sound system. As the dancers fill the stage, they are glue to their smart phones, seemingly disconnected from each other. It is a smart, relevant and well-executed commentary of the nature of social media addiction. 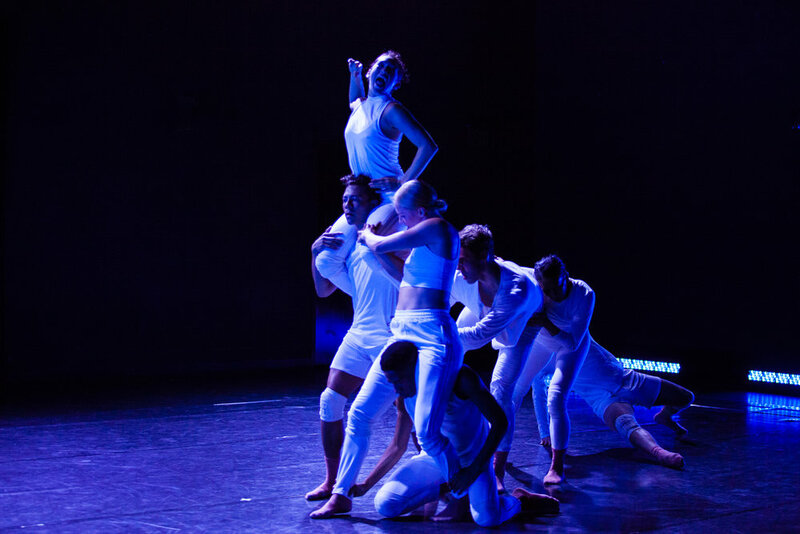 As the dancers put down their phone, they begin to move together, seemingly forming genuine connections that are normally absent from the illusion filled world of social media connectivity. The second piece comes from the brilliant mind of Adam Barruch. “Summoning” projects a mystical quality. The choreography was extremely fluid and nuanced, with a high level of attention paid to the transitions between both group and individual choreography. The number relies heavily on props, but this only served to highlight, rather than distract, from the story being told. The last piece of the evening may just be the best that Whim W’Him has ever produced. “Limitation Etudes: 7-10” is simply a transcendent work of art. Created by Banning Bouldin in the aftermath of her Multiple Sclerosis diagnosis, this series of pieces explores the concept of movement constrain in the wake of such a painful diagnosis. The entire series is fraught with emotion and some of the most nuanced, intricate and well executed choreography I have ever seen produced by Whim W’Him. With this creation, Whim W’Him has evolved to the level of iconic. On an individual note, it is clear that Karl Watson has replaced Patrick Kilbane as Whim W’Him’s principal male dancer. Watson is featured heavily throughout the evening and had moments of brilliance in both his partnering with Jim Kent and Mia Monteabaro, as well as in his own solo movements. Whim W’Him continues to raise the bar. It is clear, based on the fantastic talent on display, that it’s 8th season will be truly iconic.